Dare to be different? 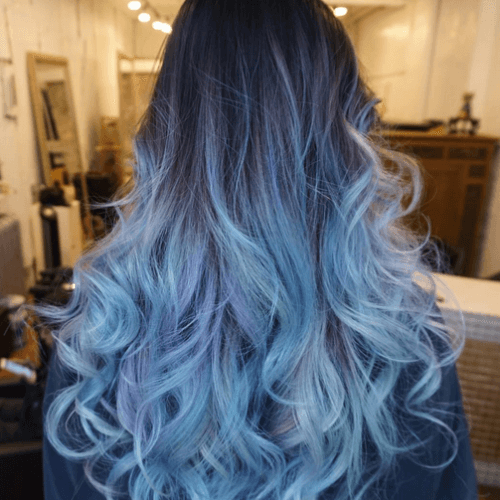 Get a fresh start with blue ombre hair! This sensational color is certainly one for the bold and beautiful, who don’t shy away from expressing themselves. If you have an artistic personality, love showing your creativity or you just want to try out a spectacular new hair color, blue is for you. Let your inspiration flow with our favorite breathtaking ideas below! 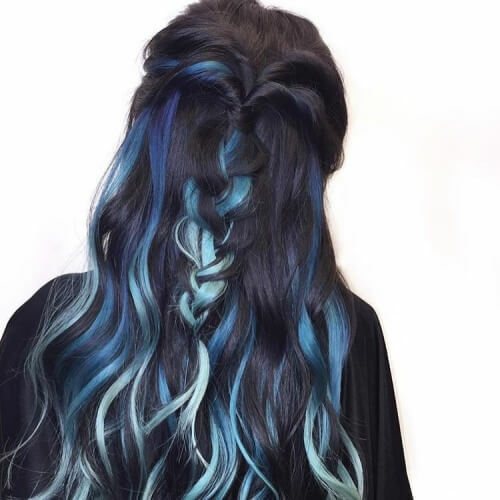 One of the most popular blue ombre hair ideas out there is with black. The raven roots provide a smooth transition to the cool secondary color. Natural brunettes should definitely keep this idea in mind for minimum maintenance. Not all of these ombres have to be in classic blue shades. 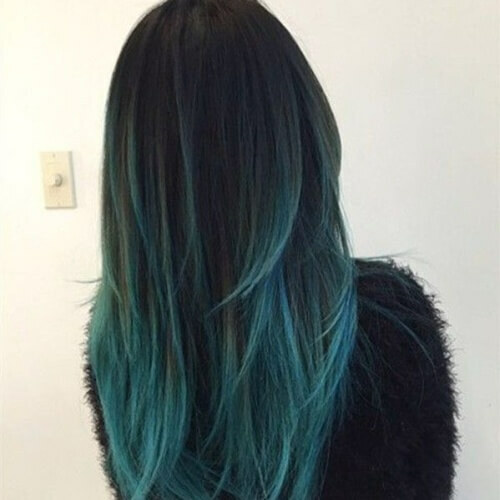 If you want to add some personality to your ombre hairstyle, you can opt for a teal tone. Blend it marvelously from a dark base and you will be radiant. In addition to black roots, brown roots are just as trendy when combined with blue tips. In most cases, women who have brown hair try this combo out for the same reason as brunettes. You won’t struggle with maintenance or visiting the salon every month for retouches. 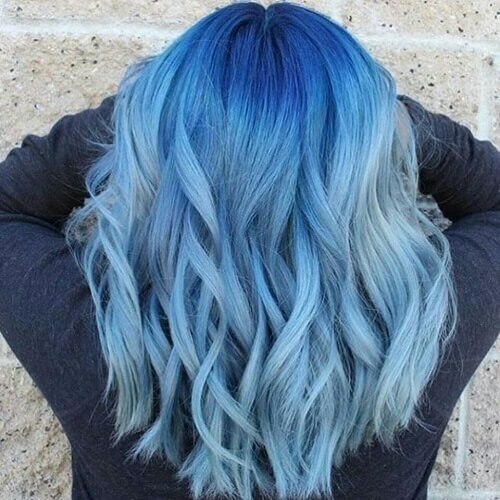 If you want to completely stand out, experiment with ombre hair entirely in blue. Instead of mixing the blue with an earth tone, you can play around with different shades of this cool color. For example, you can start with a royal blue base and continue with pastel. Like we described when discussing red ombre hair ideas, this coloring technique can be applied even on super short hair. 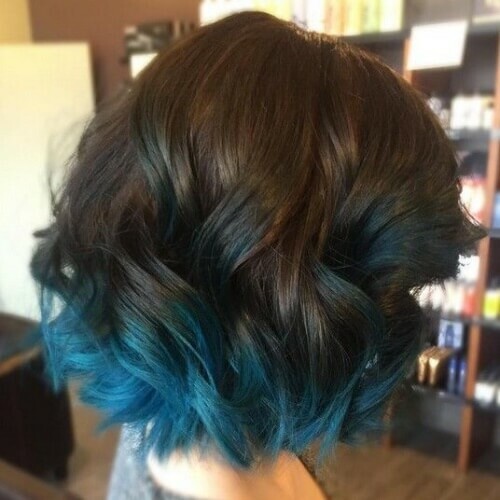 If you have a pixie haircut, don’t hesitate to try out a blue ombre. You can keep the shorter part dark and let the blue glow on top. For a mysterious and romantic approach to blue ombre hair, think about going for darker tones. Navy or any darker shade of blue can look amazing, especially when it springs from an even blacker base. Don’t hesitate to take this alternative into consideration for a chic outcome. 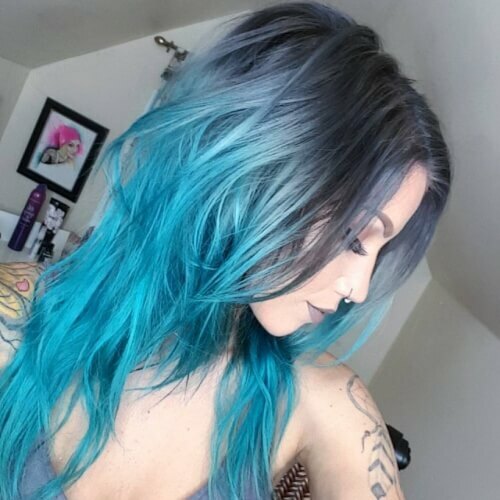 Even though you can get blue ombre hair with short haircuts, it arguably looks the best on long hair. 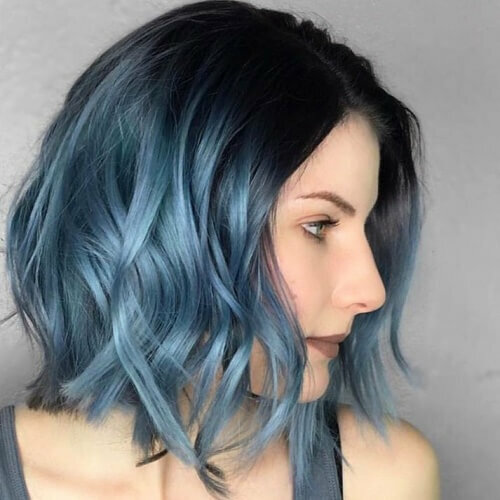 No matter if your long locks are straight, wavy or curly, the blue color transition will be easily appreciated thanks to their extended length. 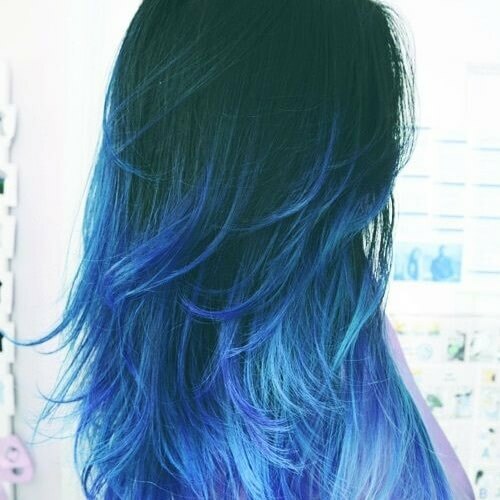 Now this is a blue ombre hair idea that will make heads turn. As opposed to most options with blue and similar colors, this photo shows that a striking contrast can go far. Electric blue and equally electric magenta are phenomenal together. If you like the idea of neon hair but want to tone it down with the secondary color, think about this approach. While the second half is as neon as you can get, the top blends from black to an ashy and metallic blue. We have recently dedicated an entire article to mermaid hair, but it also deserves a top spot on this list too. 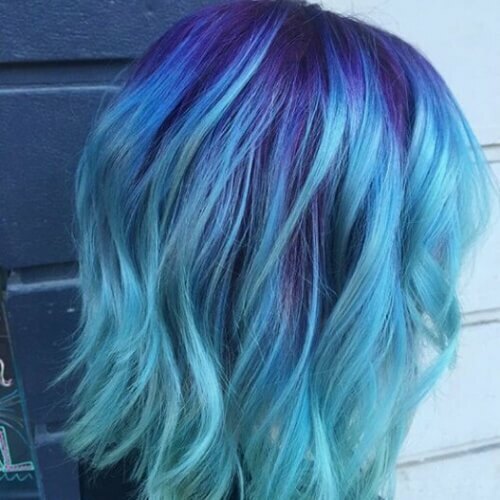 All colors in this ombre hair idea are inspired by the sea, with blues ranging from vibrant to rich and deep as the ocean. 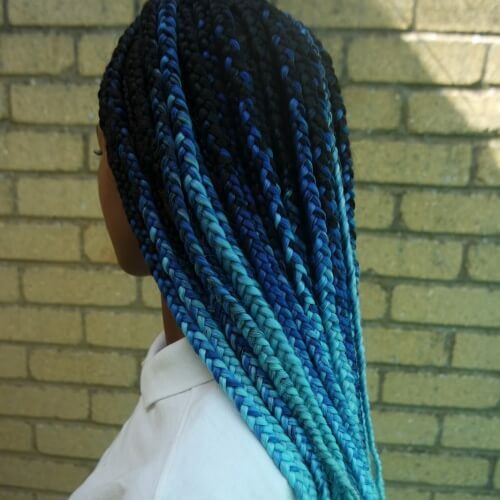 If you want to make your blue ombre hair pop, you should always remember that braids are the best. Regardless if you braid your hair tightly or loosely, this styling technique helps accentuate the different colors in your locks. We love inspiring you with bohemian hairstyles that will make you shine at festivals, dates or any other sweet occasions. 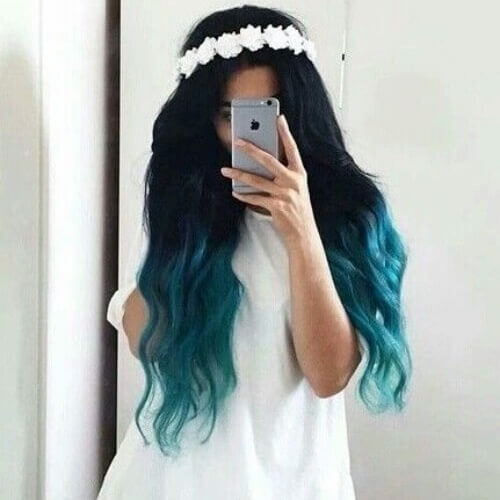 In this photo, you can see how the beautiful blue ombre hair is decked off with an adorable white flower crown. 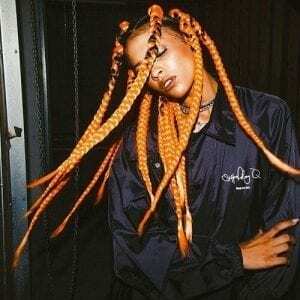 Ladies part of the African hair community shouldn’t be afraid to spice up their braid hairstyles with a bit of color. 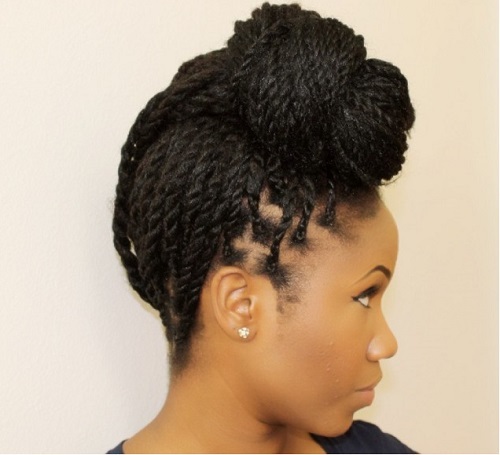 These box braids, for instance, look absolutely stunning with a royal blue to light blue gradient from a black base. 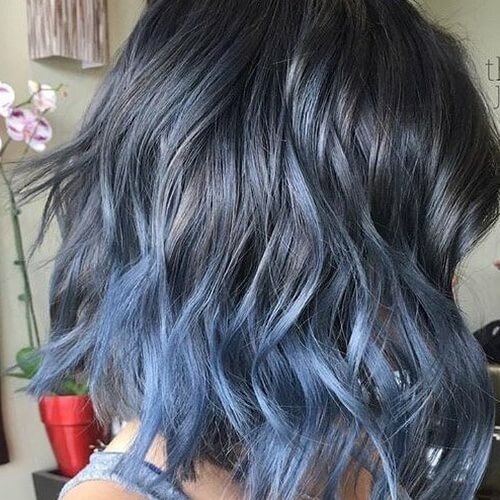 Although this hairstyle has more of a balayage tone to it than ombre, it’s an excellent way to showcase the idea of steel blue. This gorgeously metallic color looks outstanding when paired with silver hair. You may not see this hair color combo often, but when you do, it will totally grab your attention. 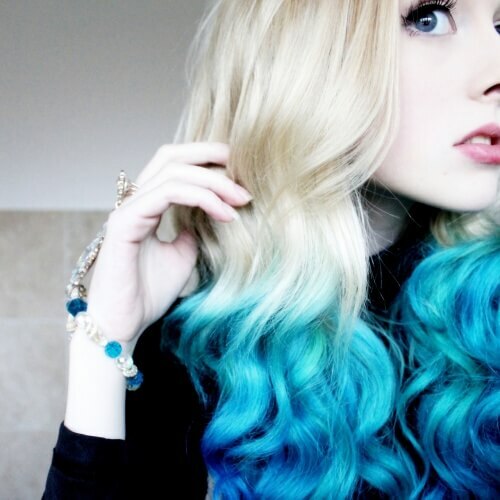 Blonde and blue hair work fantastically together owing to the powerful contrast. Even more so, it will add a splash of color to your overall look. Kylie Jenner’s iconic looks are unmistakable. Whether you see her flaunting long raven locks, a cute blonde wig or this blue ombre hair, you know King Kylie when you see her. Why not take advantage for inspiration? Get in touch with your inner fairy with this delightful hair color. The pastel blue results in a youthful, playful and cute look, all while remaining completely irresistible. We also love how it blends into silver at the tips. If you were wondering how your blue ombre hair would look with bangs, these are alluring results. 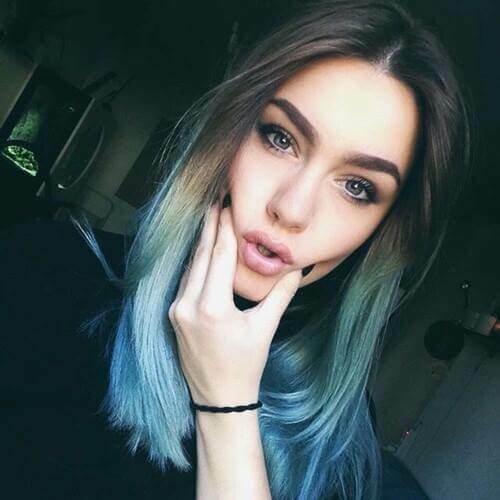 Even though the blue part leans more towards blue green, you shouldn’t hesitate to get ombre hair if you rock choppy bangs. 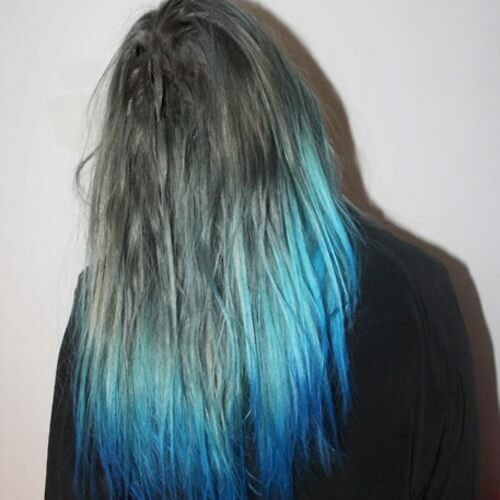 Looking for a discrete approach to your blue ombre hair, rather than a flashy one? Don’t hesitate to look into balayage options. As you can see in this photo, the color melt is subtle and extremely stylish in a black-blue combo. 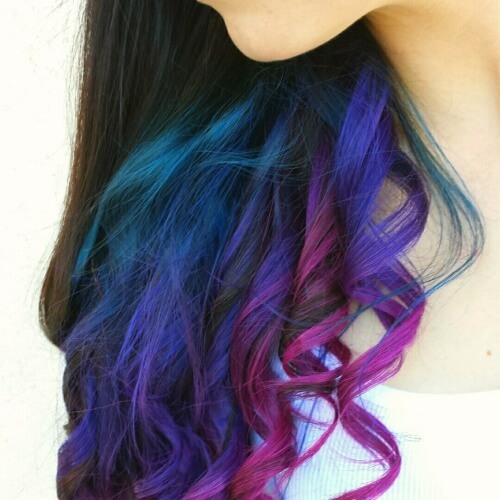 You can take your ombre hair to a whole new level by experimenting with multiple colors. For instance, you can take several shades from a cool color palette and mix them. Blue, turquoise, purple and indigo work astoundingly well together. Most ombre hairstyles involve mixing the two colors in a half and half manner. Nevertheless, you can always use more of one color and less of the other. 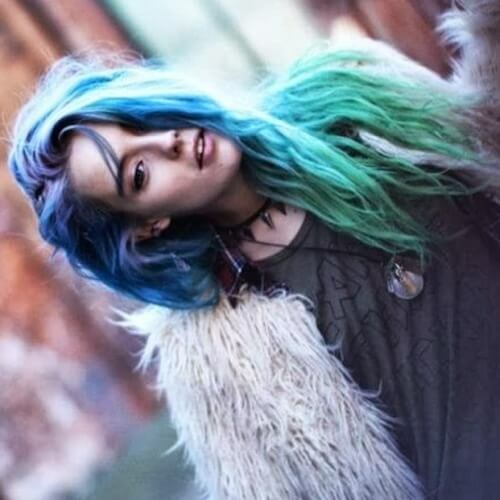 For example, this photo shows how bright blue hair looks with black roots. 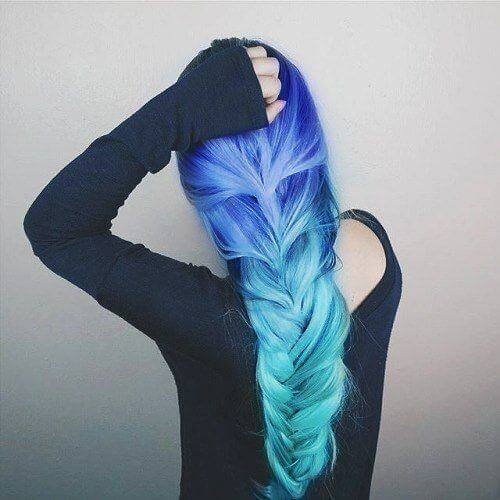 Another braiding style that will help your blue ombre hair stand out is the waterfall braid. If you take a look at the specific styling in this shot, you will see how the top part of the braid is one color and the bottom in another. We love it! This is easily one of the dreamiest hairstyles we’ve come across all day. 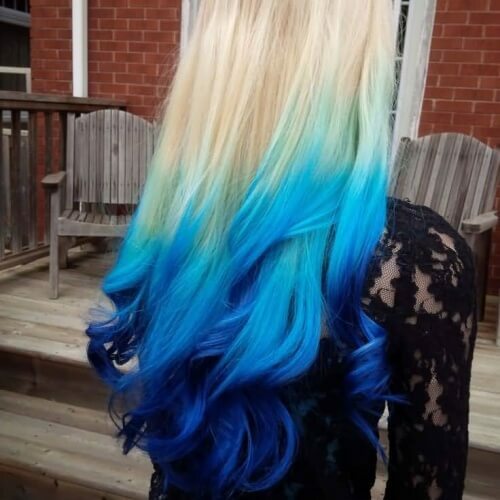 It levels up the whole blonde and blue ombre hair idea, desaturating them for an almost white outcome. If you want to feel like a princess, this is the look for you. Gray hair and blue hair go hand in hand. 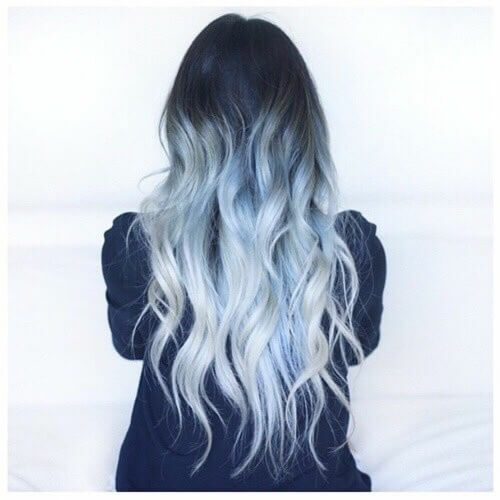 When thinking about ombre options, you can consider mixing blue locks with gray, silver or other ashy tones. In this example, you can admire a charcoal, baby blue and royal blue blend. We already know that brown and blue hair go very well together. However, you can always just aim for the tips. This is a terrific idea for women with shorter strands who want to give their hair a funky twist. 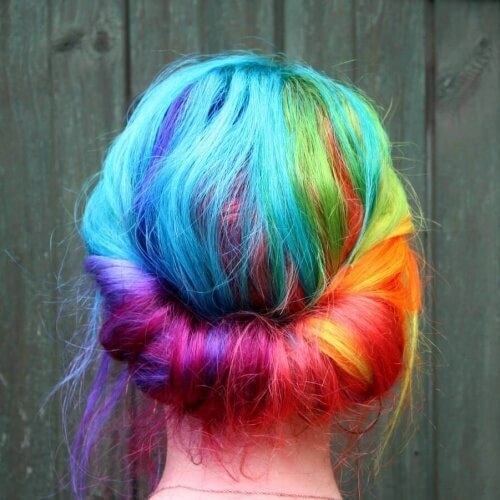 Want to go all out with your cool hairstyle? 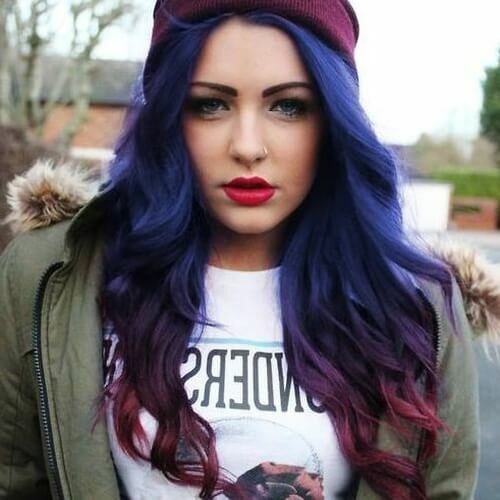 Be brave and think about coloring your roots in purple and leaving the rest blue. 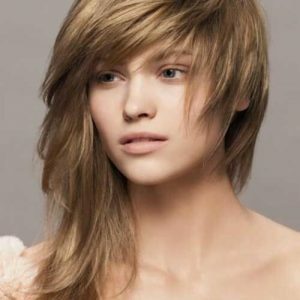 It’s a style that gracefully falls under the mermaid hair category, and we love every part about it. An unexpected yet brilliant color combo is red with blue. When using these two shades in an ombre hairstyle, you also enjoy a chic purple transition from one color to the other. The longer your hair, the more impressive this hairstyle will be. On the other hand, you can switch things around and go from blue to red. You will still enjoy the violet gradient, so you don’t have to worry. 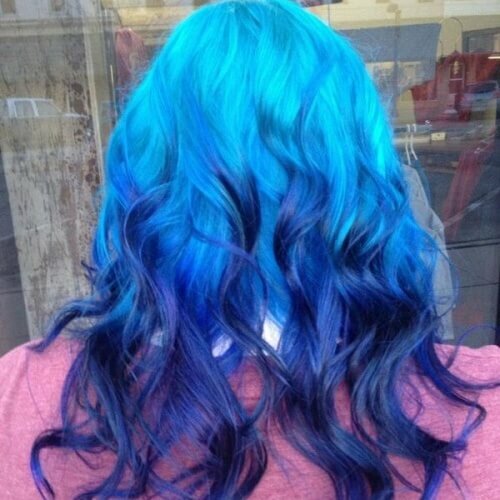 We recommend this idea for women who want more blue than red in their ombre. 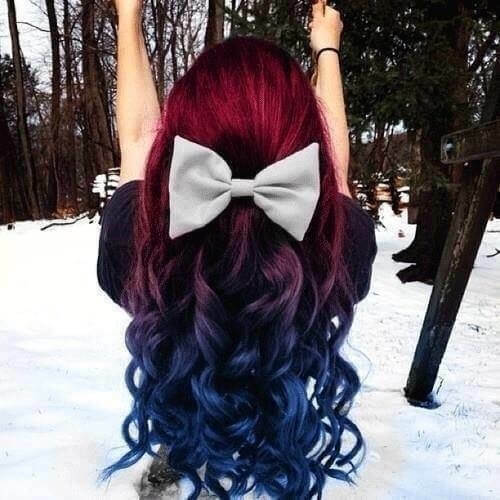 Another way you can sport steel blue hair is shown in this sweet photo. 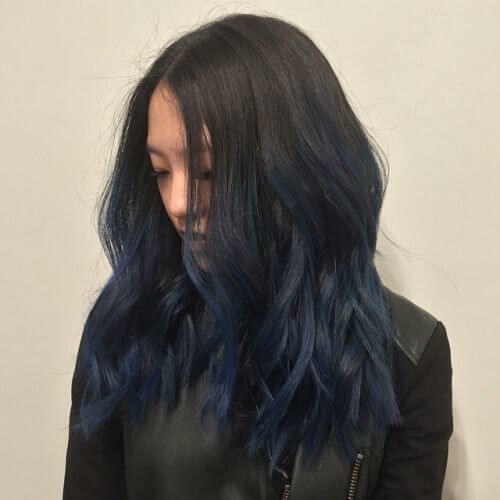 The roots are black, while the rest of the hair blends out into this superb shade of metallic blue. It’s a highly flattering look for women with pale skin. We’re back to the brown-blue idea, but this time we lightened everything up. If your natural hair color is light brown or dirty blonde, we encourage you to mix it with a lighter shade of blue for your ombre hairstyle. Why settle for two colors when you can have three in your ombre? No matter what your base color is, you can pair it with two different shades of blue that melt magnificently into the other. 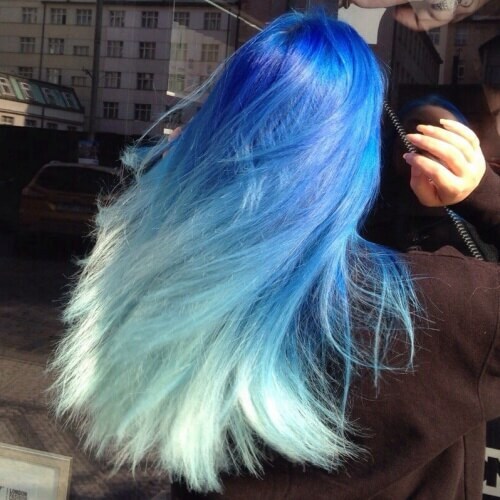 Take this photo as an example, with blonde, bright blue and deep blue. 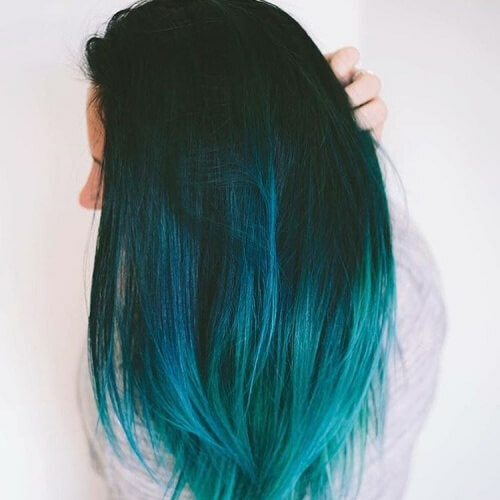 For a grunge approach to your blue ombre hair, consider melting into an unconventional color. As you can see in this example, the pale blue base color dips into intense rusty orange tips. You also get an enchanting ashy transition. 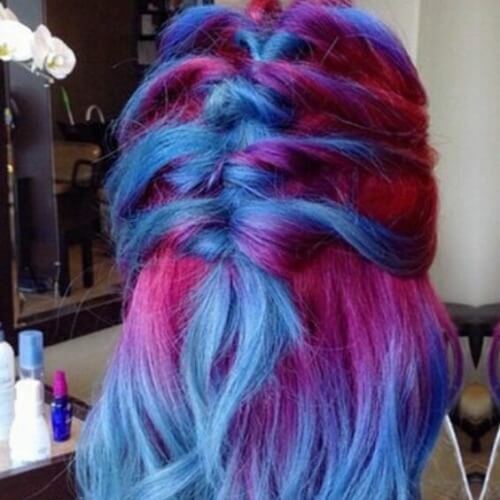 A super neat way to rock blue and red hair is with this coloring approach. 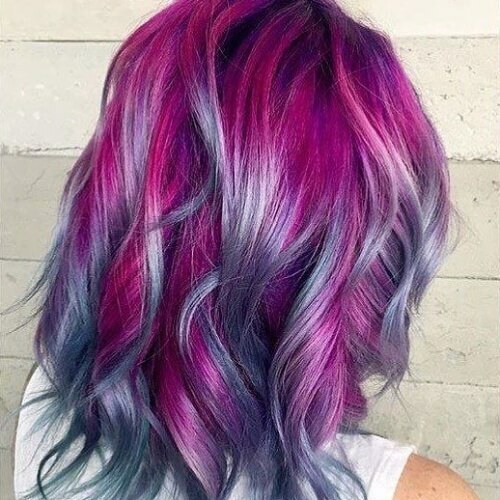 To top off your unique ombre, consider creative styling. For example, this is a half up half down braided hairstyle that will make you the center of attention. 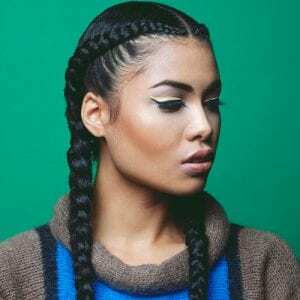 We can’t get enough of braided hairstyles, especially when dealing with ombre hair. 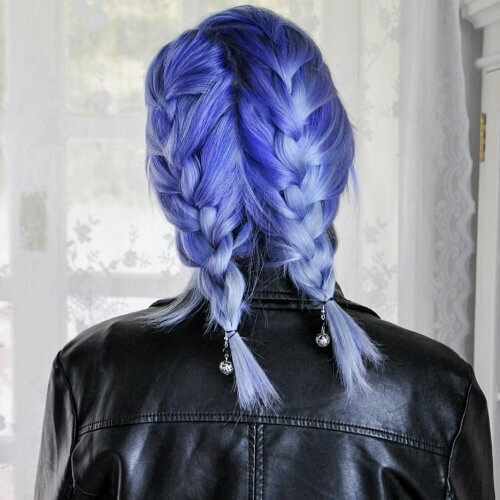 Two loose French braids fabulously complement this delicate blue to silver gradient. We also dig the cute hair ties used for the pigtails. 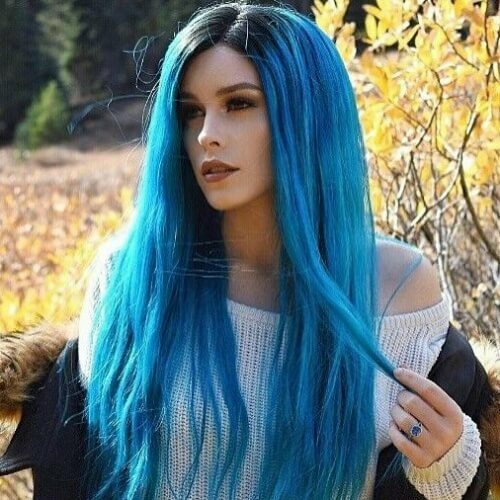 If you’re not into the traditional dip technique that ombre comes with, you can take the blue hair idea and use it for highlights. In this shot, you can feast your eyes on a coloring session that ended in delicious blue and silver highlights. 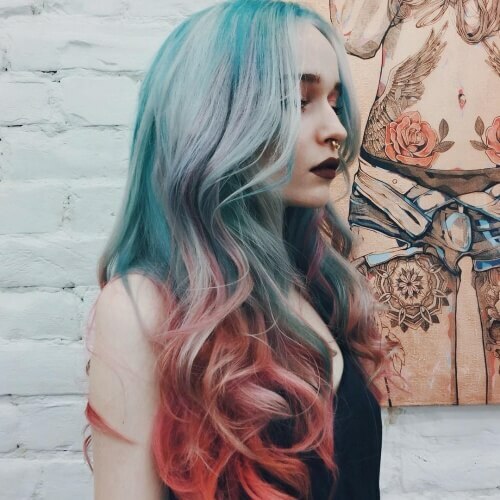 Mermaid hair is back again on our list, this time with pastel blue and green tips. We also appreciate the subtle purple tint on the roots, making the hairstyle stand out even more. 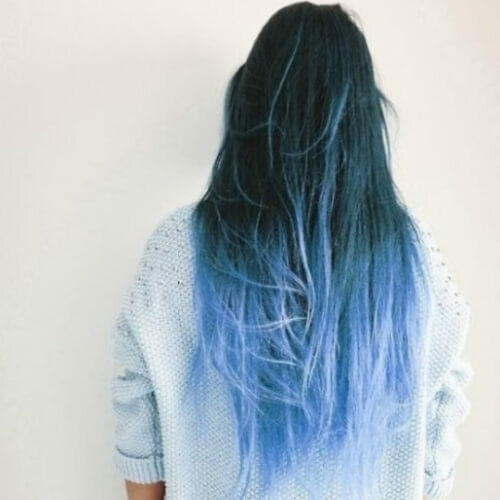 If you have long hair and are outgoing, this is the blue ombre hair option for you. Can’t choose between neon and pastel? Use both of them! 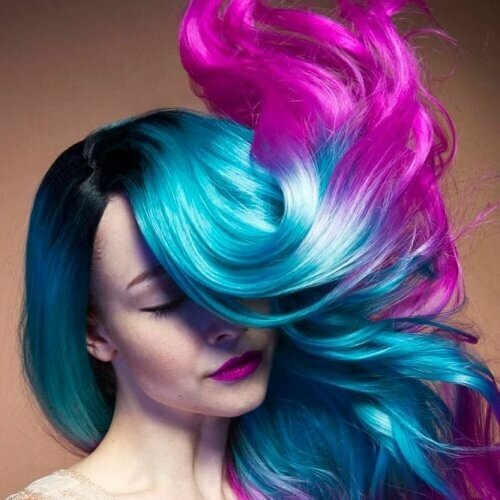 Your ombre can start with an eye-catching neon blue, which continues with pastel pink and silver locks. We also adore the way ombre and highlights were combined for a unique outcome. 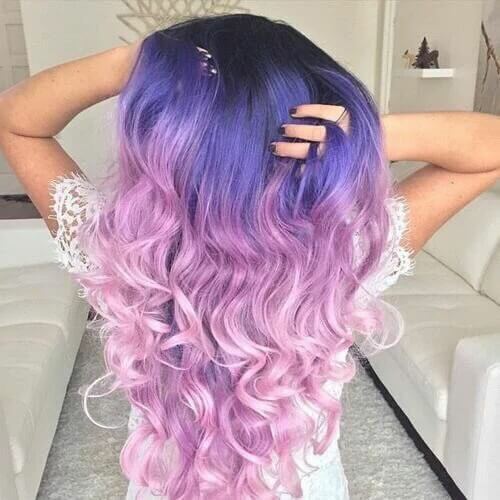 This periwinkle ombre has us daydreaming for good. 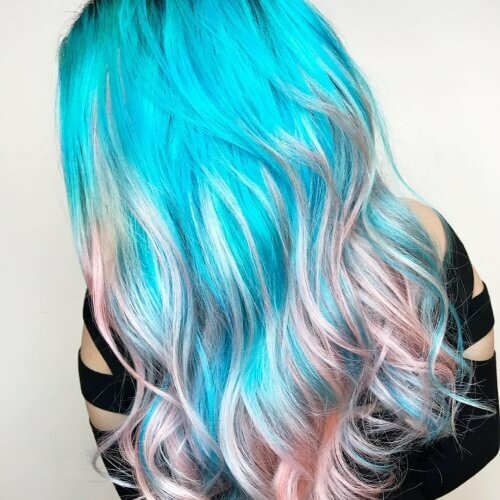 What makes this blue ombre hair idea so special is that it mixes multiple details, from vivid, to pastel, to metallic and more. It’s yet another charming option for gals with long hair. Still haven’t found the subtle blue ombre hair you’ve been longing for? Here’s another idea to inspire you. The dark brown and super dark navy colors blend in an extraordinary way. It’s an exceptional hairstyle for a classy look. 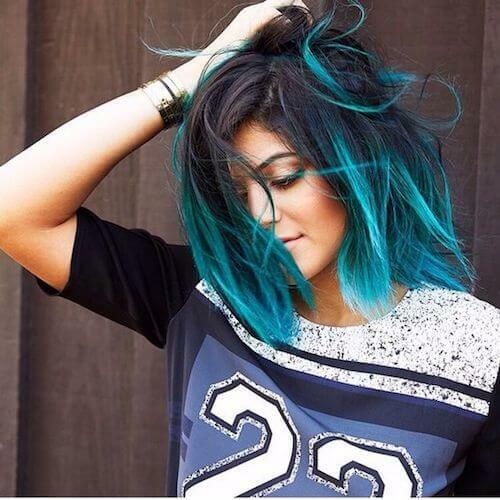 Even though this hairstyle is pretty close to the famous Kylie ombre bob, it stands out through the lighter tips. While the first part transitions from black to dark teal, the tips glow with a glamorous shade of turquoise. 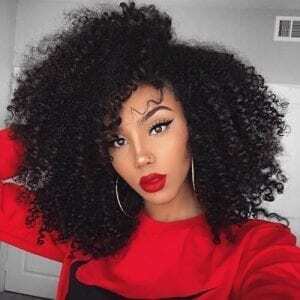 Don’t worry, we won’t neglect our lovely curly girls. 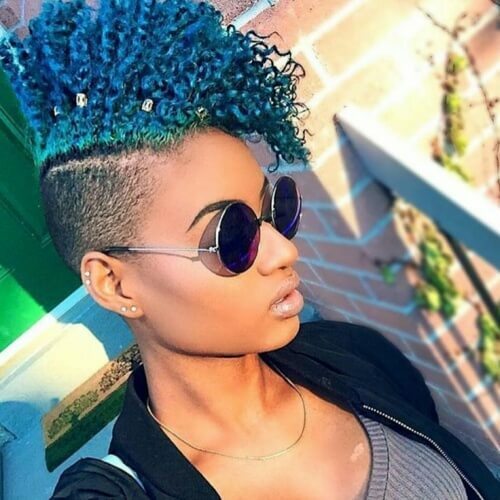 Blue ombre hair looks absolutely radiant with this hair texture, as it highlights your natural corkscrew curls. 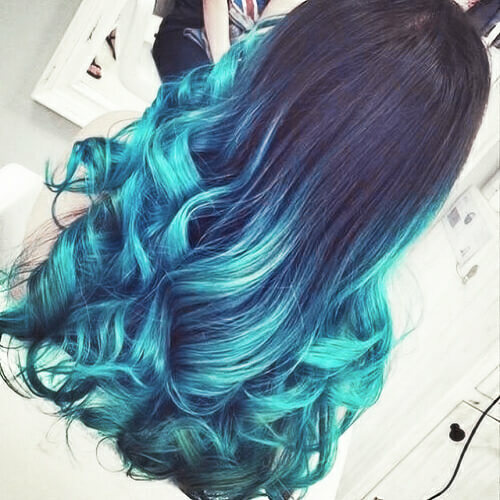 This is what your ombre would look like if you go for a deep teal. Leave an unforgettable impression wherever you go with cyan blue ombre hair. In addition to the flawless coloring, this example also shines through the styling. 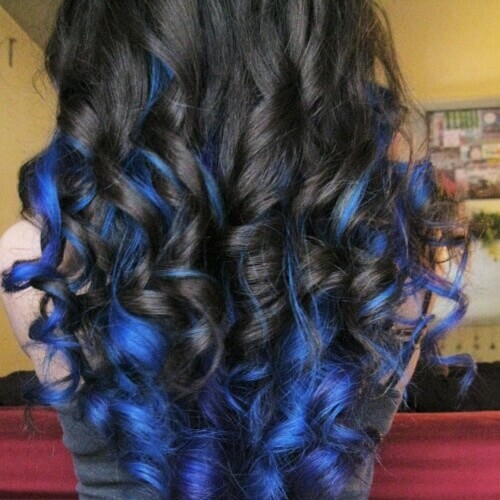 The base color is left with straight hair, while the electric blue is emphasized through loose curls. Yet another hairstyle fit for a fairytale princess is this indigo and lavender pink mix. 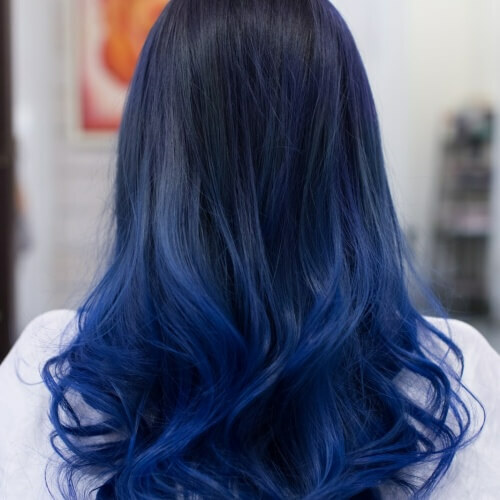 It’s not precisely blue ombre hair, but the top part has a ravishing indigo tint that you’ll adore. Feel free to tweak the tones until you get the color you desire. Blue and purple were obviously made for each other. In this photo, you can appreciate a rich purple base with a velvety royal blue secondary part. If you’re bold and not afraid to show it, make sure this idea makes your shortlist. Remember what we said about short hair and blue ombres? This example definitely proves our point. 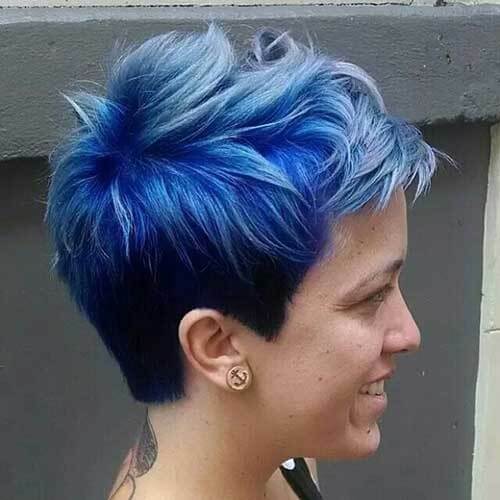 If you have a razor pixie with an undercut, you can leave the shaved part your natural hair color and use blue for the voluminous top. P.S. Just look at those pretty silver beads too! Another look for the modern day princess is this blue to white blend. 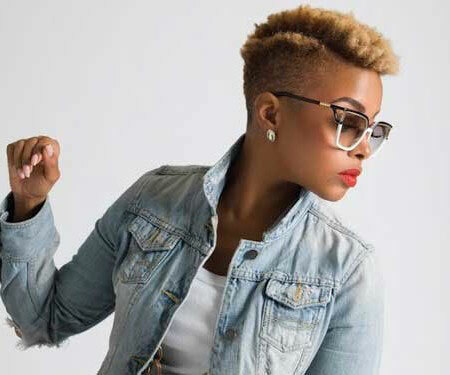 Even though this hair color masterpiece will be challenging to maintain, it’s a wonderful option for adventurous women who want to stand out creatively. Why settle for classic blue ombre hair when you can get all the colors you have dreamed of? 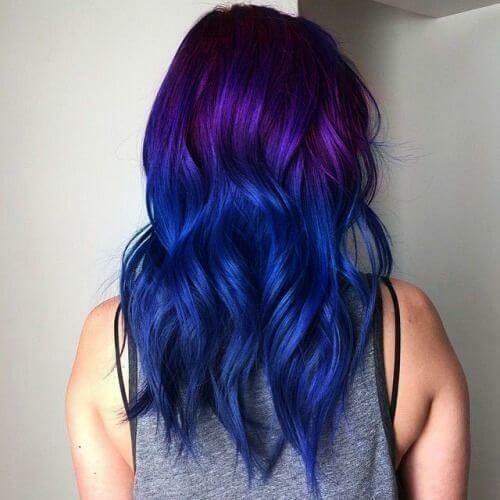 You can rock rainbow hair with a primarily blue base, like in this photo. Make sure you keep the twisted hairstyle in mind too. To confirm the fact that purple and steel blue are the perfect pair, take a look at this beauty. We also want to point out the way the hair was colored, in larger chunks rather than half and half. We think it’s jaw-dropping. Another way to create your own version of blue ombre hair is with undertones. You can also dye just the tips in royal blue, but we encourage you to play around with full blue undertones for an original approach. Last but def not least, shout out to our sublime gals with afro-textured hair. 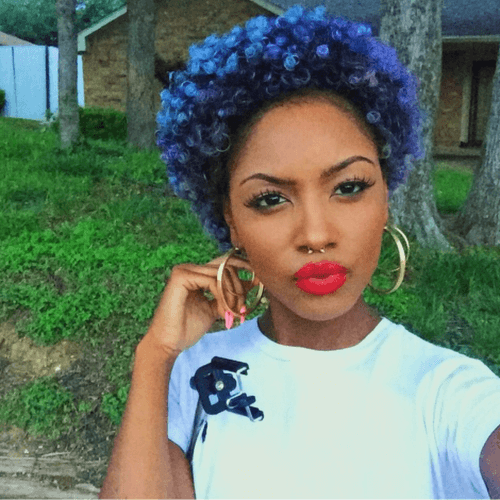 If you have a TWA or even small extensions, you can bring your lavish curls to life with a bit of blue. It’s a small detail that will go a long way. 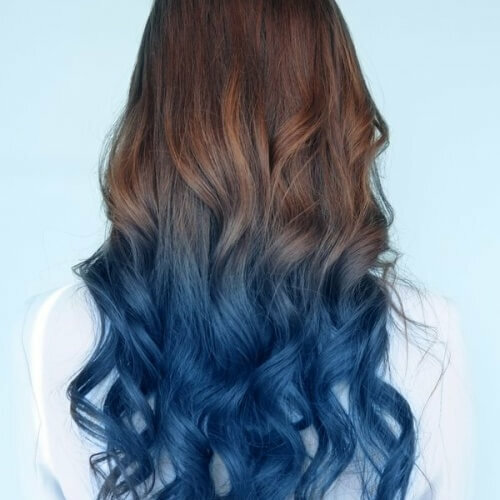 To conclude, blue ombre hair will help you stand out in a dazzling way. Although it is indeed a daring hair color, there are both flashy and discrete options available. 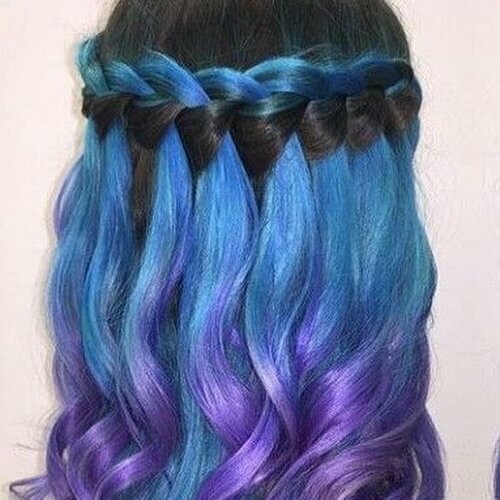 No matter if you keep it classy with a deep navy blue or go all out with cyan locks, this ombre idea will have you loving your new look. Which photo inspired you the most? Let’s talk about it in the comments! You are very welcome, Jessica! We made sure our source link leads back to your Instagram.